No vegetables in your fridge? Not much time on your hands? No sunshine outside? Just plain ol’ hungry? Make this easy, satisfying, healthy Pongal. Thank you Poppy, over at Poppy’s Patisserie, for your Creamy Potato Alfredo Pasta recipe which made me think of healthy, tasty, comfort food ideas. South Indians and rice are often inseparable, as are south Indians and pressure cookers! Pongal is actually a simple and rather basic recipe that straightforwardly combines rice (carb) with mung bean (protein). The rest is really up to the chef though the addition of turmeric is common, giving this dish its familiar, comfy, yellow hue. This is my go-to dish on cold, rainy days or whenever I am in a hurry but still want to cook something healthy, filling, and yum. I’ve left out the ghee (clarified butter) in this version but it’s still “comforting” enough! This recipe is suitable for diabetics, weight watchers, and comfort food cravers! Just ensure you stick to your regular portion size, because this easy-to-cook dish is easy-to-overeat! All set to make this easy Pongal? 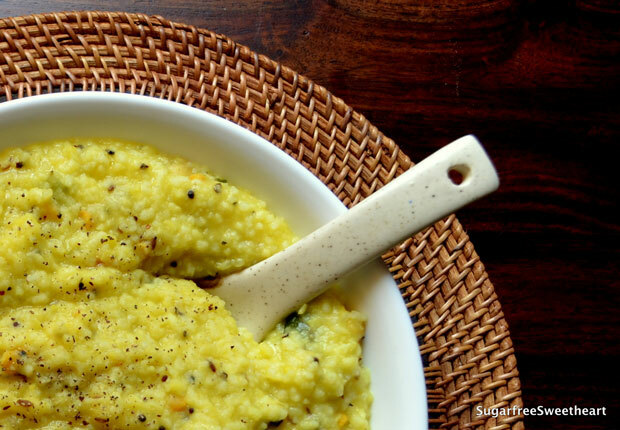 The trick to a comforting Pongal is to “overcook” the rice and dal a little bit so that it becomes slightly creamy. Add more water while cooking the rice-dal mixture than you would need to get them just cooked, and cook them for longer than you would need to get them just cooked. Add freshly ground pepper just before serving for an extra hit of peppery goodness. Soaking the chana dal is optional. However, the less you soak, the more you will have to roast the chana dal to ensure it softens enough to crunch on. Definitely the ultimate comfort food for South Indians. I have never used channa dal in my pongal recipes, should try with that. Also adding a cup of fat free milk while cooking the rice and lentils make it very creamy. Okay…waiting for next post…too long a pause !.. Not accepted. Coming soon, Sonal! I’ve been away attending family ceremonies.. I’m back now but I’ve caught a stupid cold which makes me lazy to cook! But thanks for demanding a post.. Will pull up my socks and get one out later tonight if I can! No worries Priya.. Take your time and rest good. Drink masala chai and relax :). Delish Delish! I prefer my pongal slightly drier than the picture and just drive in with coconut chutney and maybe sambar…. Crunchy on the outside soft on the inside vadais will be good also…. finish it off with filter coffee. Er… what were we talking about exactly?
! !II would totallly digg in with some freshly spiced grilled fish on the side for me, please! Hey there! I nominated you for the I Am Part of the WordPress Family Award. Please get the badge at http://wp.me/1Kc0N and follow the instructions! Will be checking out those other blogs too.. this is a great way to find new awesome blogs! Not a problem! Glad you’re checking out the other blogs too! I really love your recipes! 😀 You can make any amateur love cooking! 🙂 Especially me! Oops.. totally forgot to write about what to serve it with! 🙂 Well, now it’s in your comment! Thanks, Namrata! Love it :). It is in khichdi category :). I made khichdi yesterday. Nothing to beat a simple pulses and rice dish:). No seriously that is what we call this kind of dish in north :)..
Aww, thanks Celeste. It’s great when the photograph conveys at least a hint of the feeling you get when you make the dish. Hope you get a chance to make a version of this sometime!